The Allport family of Crookwell has long been involved in the local harness racing scene. On Sunday afternoon sister and brother Sallyann and Damon will be hoping their pacer Boyd Writer can take another step forward in his short but promising career. As part of the important Hewitt Memorial race day, the $10,000 Robert Allport Memorial Club Menangle Where Horses Fly heat is the race Boyd Writer has been set for. One of many horses trained by David Hewitt out of his Goulburn stables, Boyd Writer is a last start winner at the Goulburn Paceway. He boasts the good record of 5 starts for 3 wins, 1 second and 1 third. “Dad always thought we had a pretty handy horse in Boyd; it’s sad he hasn’t been able to see him get there” explained Damon. Robert and Brenda Allport bred Boyd Writer out of the family owned mare Innocent Art and the prolific winner producing stallion Sportswriter. The couple has since passed, with Robert’s death coming in July 2018; however their siblings are continuing the family tradition of breeding and racing Standardbreds, and with some sadness they are now enjoying the fruits of their parent’s efforts. Boyd Writer kicked off his racing career in July 2017 with a sound third at Bathurst. At his following start, the two year old provided a glimpse of his ability convincingly winning a 2 year old colt and gelding pace in a solid 1:57.2 mile rate at the Bathurst track. Turned out to develop, the horse was severely injured in a paddock accident soon after. He was treated at the Crookwell Veterinary Hospital and then spent a number of months recuperating, firstly at the veterinary Hospital and then under the watchful eye of Robert Allport in the family stables. “Dad did a lot with Boyd; kept him stabled at home and watched over him all the time. He’s racing today because of the work and care dad put into him” said Damon. Missing his entire three year old year of racing, Boyd Writer resumed at Menangle in early December 2018. 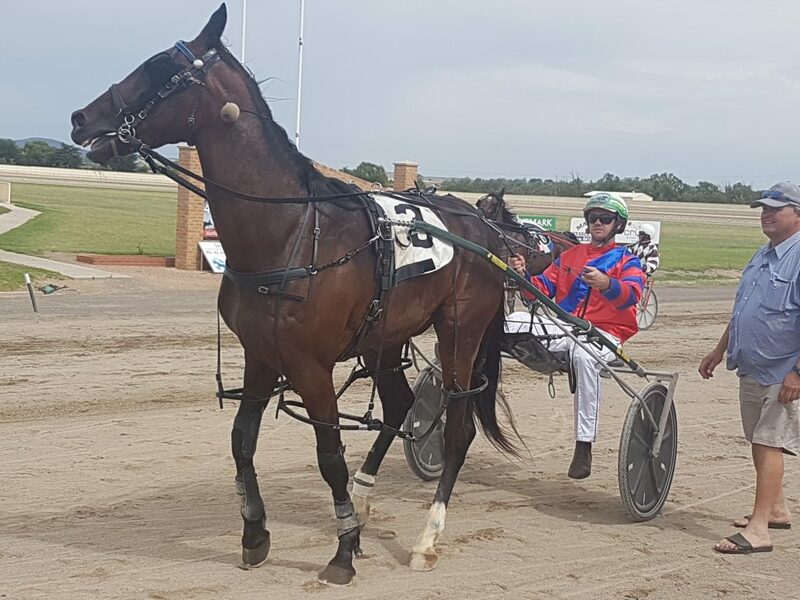 Finishing a close second, he followed that performance with a dominant win at Canberra in mid-December, before scoring an easy win at Goulburn a fortnight back. While Boyd Writer will find Sunday’s race much harder than his earlier starts, Sallyann and Damon will be hoping the family’s pacer can make the transition and in doing so verify the opinion held by Robert Allport. The Hewitt Memorial race day kicks off with race 1 at 1.37 pm on Sunday afternoon at the Goulburn Paceway. Celebrating the memory of Tom and Angela Hewitt, Aubrey Frost and Robert Allport, the day is also a big fundraiser for the Crookwell Community Trust charity. Entertainment has been organised for all the afternoon with Thomas and Lachlan Bensley performing a number of classic song hits. There are great raffle prizes to be won and outstanding food and facilities. With mini trotting and an action packed program of exciting harness racing, the Goulburn Paceway is the place to be Sunday afternoon.